I LOVED The Sound of Music as a kid. My very earliest memories are of me and my mum watching the film every single day. At the age of 4 or 5 I would make us sit down and watch it every single afternoon, where I’d fall asleep cuddled up with my mum before any of Nazi stuff near the end would have started. I must have thought it was just a fun musical about some kids learning to sing. Of course I grew up 30 years after The Sound Of Music had dominated the film and music industries, where the soundtrack spent a total of 70 weeks at #1. That ridiculous number is even more impressive when you consider that The Sound of Music was the biggest selling album of 1965, 1966 and 1968 with just a certain iconic album by The Beatles replacing it at #1 in 67. I guess that all anyone had to buy back the was a Rodgers and Hammerstein musical about a nun bringing joy to a family in Salzberg through music. My favourites here are surprisingly the ones with the children, perhaps owing to how I grew up with this as ‘my’ musical. Do-Re-Mi is ridiculous, but in the best kind of way, while So Long, Farewell is a happier goodbye than Edelweiss. Out of context though it all doesn’t really make much sense. You can’t hear that opening build up of ‘The hills are alive with the sound of music’ and not picture Julie Andrews running up said hills. As a soundtrack it needs the movie itself to be a truly worthwhile listen, but obviously the record is a much easier thing for the British Public to sing along to. It’s why it appears here I think, both one of the only Soundtracks and the oldest album on the list. It’s a classic movie, with some classic songs and a chart career that would be near impossible to emulate. Will I listen again? : I’m sure that I will watch the film over and over again year after year. 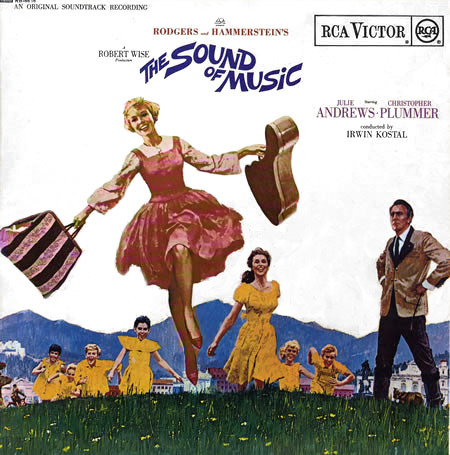 Best Track: It’s Julie Andrews’ performance on My Favourite Things that makes it my favourite track on the soundtrack. The ‘When the dog bites, when the bee stings’ bit is musical gold. Tags: The Sound of Music, The UKs Greatest Hits. Bookmark the permalink.